Many people dream of an active lifestyle full of outdoor adventures, do you? If so, take the leap and relocate to Lakeside, California. Moving here will be your first step on a thrilling journey and with A-1 Self Storage in Lakeside, California by your side you can’t go wrong! Let’s check it out. If you relish in a great fishing trip, enjoy wakeboarding, or can’t get enough jet skiing, you will thoroughly enjoy the many fresh bodies of water near San Diego, California. Lakeside is located in the western foothills of the Cuyamaca Mountains, along the San Diego River. Just 21 miles east of downtown San Diego, Lindo Lake sits near the town’s center and for decades has been a magnet for those wishing to escape the bustle of city life and settle far from the noisy highways. Once a haven for farmers and ranchers, this area started to take shape in 1886 when the El Cajon Land Company purchased 6,600 acres of the privately owned Rancho El Cajon. It wasn’t until the 1950’s when word spread that Lakeside was a great place to call home. By 1970, Interstate 8 made living in the suburbs of San Diego possible and a flood of people poured into this 7-mile stretch in the valley. By 2010, the population of Lakeside had gone from nothing to 20,000 residents. There is another view of Lakeside though that many San Diego residents might be more familiar with, and that is its reputation as a resort town. In the early 1900s, this area was known for auto (and horse) racing made famous by Barney Oldfield. He was a legendary driver who began his career by racing bicycles. Oldfield set a record on the Lakeside Speedway for the fastest mile ever completed by an automobile (51 ⅘ seconds) in 1907. City dwellers began making the trek east by buggy or train to experience the excitement and stay in the historic Lakeside Hotel. Many people continue to enjoy the great outdoors in Lakeside, especially fishing. Moving here could mean daily trips to lakes and reservoirs fully stocked by the California Department of Fish and Wildlife! If you need to relax, consider the shores of Lake Jennings, El Capitan Reservoir, and the San Vincente Reservoir. El Capitan Reservoir is an ideal place to explore by boat. The park has generous hours of operation and you can even load up on snacks at the concession stand before fishing. Permits are only $35 a day. Camping is the thing to do at Lake Jennings! The park invites visitors of all ages to “be a kid again” while cooking s’mores and enjoying other camp traditions. The desert truly meets the lake here and 35 full hook-up parking spaces make it easy for you to pull up in your RV and enjoy a relaxing getaway. If kayaking and water skiing are more your speed, San Vincente Reservoir sells permits and rents kayaks. Note that this park has steep sides leading down to the reservoir, so safety is always important to keep in mind while visiting. Many people enjoy the hiking, biking, and equestrian trails that run through and around Lakeside, most notably those in River Park. This winding trail along the San Diego River will have you and your family exploring Southern California’s most natural state and all the beauty that comes with it! Have you ever heard of the “Hike to Yoga Experience”? Or “Hike and Meditation Experience”? AirBnb.com advertises a variety of local activities and these are just two of many. Led by San Diego Natives, both of the classes mentioned above feature instructors who are well trained in wilderness survival skills and know these hiking paths like the back of their hand. If adrenaline-pumping activities are more your thing, you’ll be happy to know the PRCA Rodeo of Southern California is held in Lakeside every April at the Lakeside Rodeo Grounds. The rodeo grounds feature a permanent facility spanning more than eight acres. The facility’s caretakers are volunteers and the organization is known for raising money for many local youth programs. Civic organizations in Lakeside are active and if you want to be involved there is no shortage of options. Get out there, don’t be shy, and find a group with a cause that speaks to you! While fun in the sun is a must, don’t forget to save some energy for the evenings! Barona Resort and Casino is an excellent option for an evening of entertainment. Patrons say the casino is run very professionally and the food is incredible! Ranch House Buffet and it’s fresh seafood and sushi, as well as Sage Cafe, have adoring fans. Visitors like that Sage Cafe is open 24-hours, making it one of the best places in the city to get a late night snack. Eastbound Bar & Grill is a go-to for Western enthusiasts outside of San Diego. That’s right, go east of San Diego to experience the Wild West! They even host game nights and family nights. Street tacos and burgers are favorites here. They’re perfect with any of many draft beers on tap. Craving pizza? Marechiaro’s Italian Restaurant is rated the best pie in San Diego! This joint has been family owned for more than five decades and is just next door in El Cajon. It’s a safe bet for quality Italian food. Does this little slice of heaven sound like the kind of life you want to pursue? Then keep reading to learn more about Lakeside, California. The first place you’ll want to start when determining if moving to this area is for you is to break down what it will take to live here. In this part of San Diego, the average age of residents is 38-years-old, and 41% are raising a family. 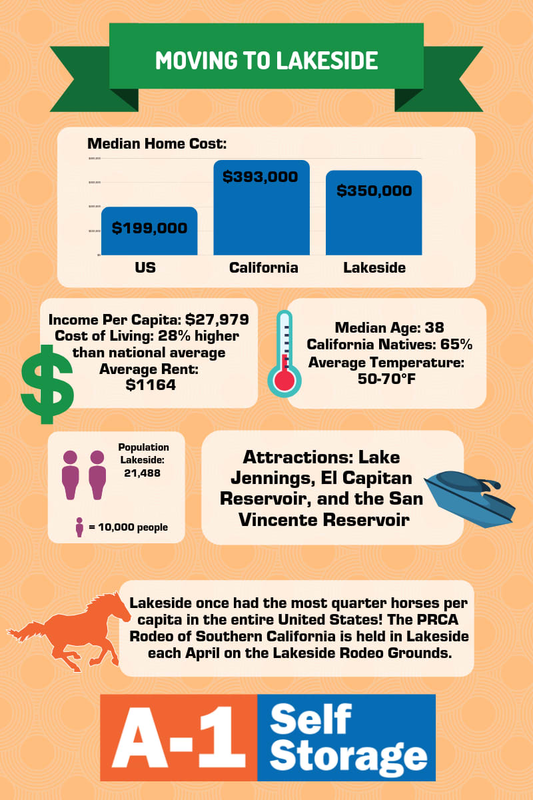 Looking over the numbers, you’ll find that the cost of living in Lakeside is 7% lower than the California average. Average income per capita for Lakeside is $27,989 and the median household income is $65,256, which is 2% higher than the California average and 18% higher than the national average. These numbers show Lakeside is an affordable option in California. What price range can you expect to pay when looking for accommodations here? Rental prices are averaging $1164 per month in Lakeside, however, 68% of residents own their homes. The average cost of a home here is $350,000 and depending on interest rates (and the amount of money you put down at the point of sale), a mortgage could very well cost the same amount as your rent payment. Overall, Lakeside is an affordable place to call home in sunny San Diego! Lakeside is a beautiful area with a lot to offer its residents. If you’ve done your homework about the cost of living in this area and are more confident than ever about moving here, what’s stopping you? Start living your best life in relaxing Lakeside, California! It’s natural to have doubts about certain aspects of moving, which is why having a partner to help you get settled in is essential. That’s where A-1 Self Storage comes in! Our self storage professionals are not only prepared to help you find the best self storage unit for your needs and budget but we also genuinely care about your experience moving to the area. We always have moving and packing supplies in our office, along with a friendly self storage associate who can answer any questions you may have! We can’t wait to help you start your life in one of San Diego’s trendiest suburbs, so stop by A-1 Self Storage in Lakeside, California or give us a call and rent today!